November 8, 2018 -- The British Institute of Radiology (BIR) has awarded its Distinguished Service Medal to Gunter Dombrowe, a past president of the Radiology and Oncology Congresses (ROC) and who previously served as president of the BIR. Dombrowe played an important role in the ROC, which oversees the U.K.'s largest annual imaging and oncology congress. He also served as managing director of Siemens Healthineers for the U.K. and Northern Europe, and was a member of the Siemens board. 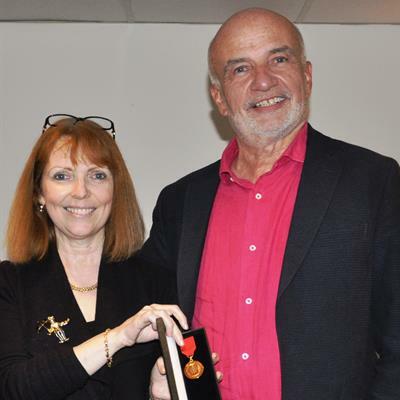 Dr. Jane Phillips-Hughes, BIR president, presents Gunter Dombrowe with the Distinguished Service Medal. Image courtesy of the BIR. Dr. Jane Phillips-Hughes, president of the BIR, presented the award to Dombrowe on 1 November and cited his commitment to the organization, as well as his dedication to the radiology and radiation oncology communities, as just a few of the many reasons for the award.